Hey there, friends! 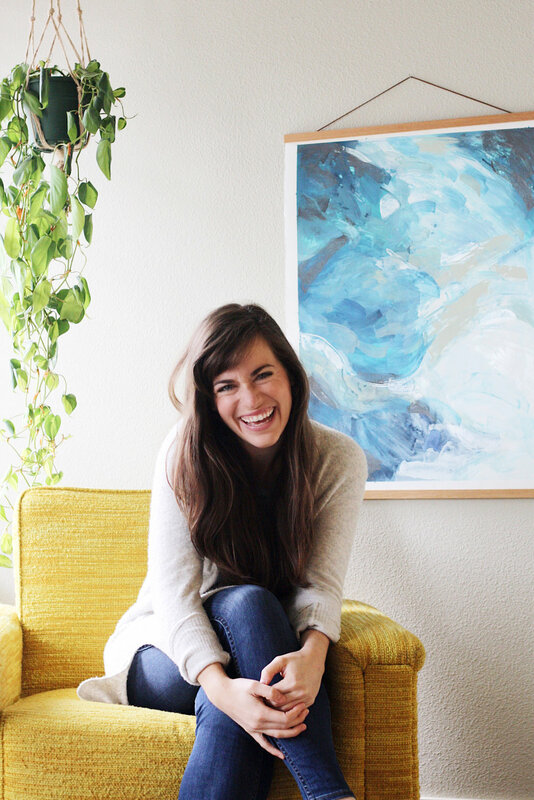 Today I'm super excited to share an interview with my dear friend and crazy talented jewelry maker/boss lady, Ellen Mote. Ellen and I met at a book club when I first moved to Portland. I had shown up alone (#residencywidow) and on my bike, looking all sweaty, disheveled and semi-desperate for friends. Enter Ellen, looking beautiful and put together and carrying some fruit and homemade vanilla bean whipped cream. I knew that I had to convince her to hang out with me. Somehow I pulled it off and have loved getting to know this sweet girl over the past year and a half. Beyond her impeccable style and cooking abilities, Ellen has a heart of gold. She's one of those people that really listens to you when you're talking and lives to serve her community. Oh, and have I mentioned that she makes some of the most beautiful jewelry I've ever seen? She and Tommy recently moved to Waco, TX (breaking my heart in the process) and Ellen decided to go out on her own and start her own business. I couldn't be more proud of her bravery or more lustful for her creations. Hi, I’m Ellen, a jewelry designer based in Waco, Texas. I am married to my best friend Tommy, and I also host a YouTube channel. When my husband and I moved to Waco from Portland last fall I did not know what I would do for work. I had been working for a jewelry designer in Portland, but knew I would not find comparable work in Waco. After lots of encouragement from friends, I did a cannon ball into the pool of vulnerability and started my own line, EM Jewelry+Design. Since then, I have been figuring out the ins and outs of owning a product-based company. There is so much more to it than simply making the jewelry! Here's Ellen looking all adorable at Cannon Beach. P.S. I've been envious of those overalls since I first saw her wear them. I love working with my hands. Making each piece of jewelry from start to finish is a time-consuming but necessary process. At various points in the day, I’ll have the goofiest grin on my face because I know the Lord has given me this gift and I am honored that I get to use I every day. I want it all. Beau, I hope you're reading this. Lily Stockman. She is part of the Blockshop Textiles duo, but what I love most are her paintings. She has an amazing eye for shape and color. She paints large canvases in muted pastels with so much light and movement. Although I love working for myself, working alone has many challenges that go unnoticed. Often at the end of the day I want someone to validate me, or reassure me that I am not crazy. The weight of being a solo-prenuer feels so heavy sometimes; so I cry a little, and then get back to work. Hey Beau, I really, really hope you're reading this. See those cuff bracelets? That necklace? Great. My self-motivation separates me from others. It’s both my biggest strength, and biggest weakness. A strength because I can get up early and stay up late to complete a task but a weakness because sometimes I put too much on my own plate and then I have no one to blame but myself! In that case, naps are a girl’s best friend (after the deadline of course). The hair pins! I die. Chocolate covered coconut chews! Which I eat every afternoon, I love my routine. Ellen, I want to be you and have all your beauty and all your talents. Thanks so much, Ellen, for sharing your gifts with the world and for sharing your story with this little ol' blog. You're a gem. And that's a funny joke since you make jewelry.